Δεν ειναι στα καλα τους αυτοι οι Ρωμαιοι! Ειναι τρελοι αυτοι οι Ρωμαιοι! Nick Tsoukas traced an old Greek edition, by Spanos Editions. There are 5 albums published by Spanos around 1970, although more stories were serialized in the journal "Αστεριξ". Note that the covers of  and  do not match the stories. Ολη η γαλατια βρισκεται υπο ρωμα.ικυ κατοχη ... ολη ; οχι ! Ενα χωριο ανυποταχτων γαλατων αντιστεκεται ακομη και θα αντιστεκεται για παντα στους εισβολεις. Και η ζωη δεν ειναι ευκολη για τους ρωμαιους λεγεωναριους που φρουρουν τα οχυρα στρατοπεδα Πετιμπονουμ, Ακουαριουμ, Λαβδανουμ και Μπαμπαορουμ. Olh h galatia brisketai ypo rwma.iky katoxh ... olh ; oxi ! Ena xwrio anypotaxtwn galatwn antisteketai akomh kai 8a antisteketai gia panta stous eisboleis. Kai h zwh den einai eykolh gia toys rwmaioys legewnarioys poy froyroyn ta oxyra stratopeda Petimponoym, Akoyarioym, Labdanoym kai Mpampaoroym. This edition was published by Anglo Hellenic Agency between 1978 and 1987. Titles marked below by * are different from the corresponding Mamouth Comix titles. The first two books of the Anglo-Hellenic series were translated by Kostas Tahtsis, the famous writer, see 'Dargaud' cover below. Although the translation was not changed, the books now carry the name of the later translator. The Greek books were originally published more or less like a periodical, one book a month. 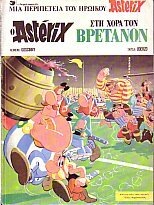 Mamouth is publishing Asterix since 1989. Titles kindly contributed by Costas Dimitropoulos. Additional information by Frentzos Hlias and Nick Tsoukas. Nick adds that the Mamouth series was printed three times, the first (1989-1992) having coloured background on front cover, and a blue stripe with 'Asterix' on it on the back cover, wheras later prints have a white background.